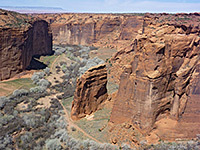 There are ten named overlooks in Canyon de Chelly National Monument, either right beside the road or along short trails; seven of Canyon de Chelly along the South Rim Drive and three of Canyon del Muerto along the North Rim Drive. Although broadly similar, each overlook offers somewhat different views, of distant ruins, rock formations and junctions with tributary canyons, so all are recommended, even though the majority of visitors see only the south rim. Apart from the White House Ruins, the ancient sites along the North Rim Drive are generally larger and more intricate. A leisurely drive along both rims, stopping at all viewpoints, takes about four hours. Descriptions are given below, together with the distances from the road junction by the visitor center near Chinle. Canyon de Chelly map, showing roads, ruins and overlooks. 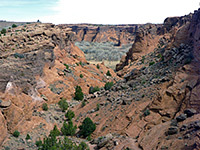 The first viewpoint is of a short, boulder-filled side canyon, which gives a partial view down to the main gorge, here still quite shallow, about 250 feet deep. 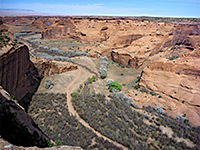 A 2/3 mile trail winds down the canyon towards Chinle Wash, but unaccompanied visitors may go only a short distance, as far as a gate; the full path is used by Navajo-led tours. There are no ruins near this location. 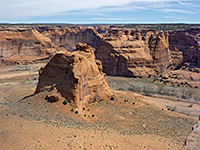 Tsegi (Navajo for 'rock canyon') is another roadside overlook, not within sight of any ruins, but opposite a broad swathe of the ravine, including a long section of Chinle Wash and areas of adjacent farmland. About 2 miles of the gorge is visible upstream, as the sandstone walls gradually rise, towering 400 feet above the streamway. One named feature in view is Blade Rock, a long curving fin that projects from the north rim cliffs right to the edge of the wash. 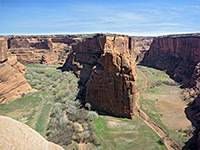 Ruins are seen for the first time at Junction Overlook, where Canyon del Muerto joins Canyon de Chelly from the north, though the actual intersection is partly hidden behind an isolated, circular butte (Dog Rock). The edge of the cliffs at the viewpoint is reached by a short trail over slickrock. There are two sets of distant ruins visible, near the foot of the north rim walls - ten-room Junction Ruin, the easiest to spot, and First Ruin a little way west. This is the most popular overlook since it lies opposite the famous White House Ruins, an 80-room settlement scenically situated beneath a graceful, slightly overhanging cliff streaked with desert varnish. But the overlook also has good views over several miles of the canyon and of a few large, semi-detached buttes upstream, from an elongated cliff edge just beyond the parking lot. The White House Ruin Trail starts here, and much of its route is in view from the overlook, as is the dirt road beside Chinle Wash, taking jeep travelers to the ruins and beyond. The White House is easy enough to photograph from the viewpoint since it is relatively close (2,000 feet) and evenly lit. There is a smaller cliff dwelling in view a little way west. Reached by a side road, Sliding House Overlook is close to several ancient structures, most visibly Sliding House Ruin, a medium-sized site in a shady alcove, built on a sloping surface and giving the appearance of sliding downwards. 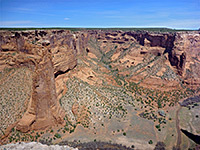 The overlook is situated on a projecting section of the canyon rim edged by sheer cliffs on three sides, and so allows different views from each edge. Canyon de Chelly hereabouts is particularly steep-walled and spectacular. The South Rim Drive veers further south to avoid a tributary ravine (Wild Cherry Canyon), then forks left at a junction and heads back northeast to the recently-created Face Rock Overlook. The rock is a prominent fin, projecting from the north rim a little way upstream; also in view are one set of ruins, nearly opposite. A very short trail leads to the overlook, right on the brink of 700 foot cliffs. The easternmost viewpoint on the South Rim Drive, and perhaps the best, is of Spider Rocks, the twin towers of sandstone guarding the confluence of Canyon de Chelly with Bat and Monument canyons to the south. A 1/4 mile path leads to the overlook, which also has a good panorama back towards Face Rock and a V-shaped tributary ravine on the north side. A 'No Vending' notice warns against Navajo jewelry sellers, who are usually in residence at all the other overlooks. The surroundings are now quite overgrown, with pinyon pine and juniper, bushes and yucca, quite different to the open, sandy, desert-like conditions around Chinle, since although the wash on the canyon floor remains fairly level, the rim plateau steadily rises; the elevation at Spider Rocks Overlook is nearly 7,000 feet, 1,500 feet higher than the town. The first North Rim overlook used to be of Ledge Ruin, but this has been closed for many years because of safety issues. Instead, Canyon del Muerto is first glimpsed at Antelope House Overlook, along a little side road. A short path heads south, soon splitting - the east branch leads to an overlook up the canyon, where a massive, protruding wall of sandstone (Navajo Fortress, once used by the local tribespeople to shelter from invaders) divides Canyon del Muerto from Black Rock Canyon to the south. The west branch is to a viewpoint of Antelope House Ruin, below a vertical, 600 foot cliff. The site is quite extensive, including kivas and towers, but is rather difficult to photograph, being in shadow all day, just beyond a strip of light colored sand which is in full sun. 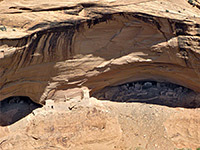 Another, smaller dwelling (Battle Cove Ruin) is visible on the south side of the canyon. This overlook, right on the cliff edge, is of a nice group of ruins on the far side of the canyon, to the northeast. The main structure, usually in full sun, is an impressive, angular, fort-like building with a three storey tower, sat on a projecting, sheer-walled buttress. There are many other ruined buildings at either side (over 80 rooms in total), in two deep alcoves near the base of the cliffs. The site was named following the discovery of two mummies nearby. Reached by the same side road as Mummy Cave, Massacre Cave Overlook has short paths to two viewpoints; one of the cave, which is another big alcove, and was the site of a massacre in 1805. 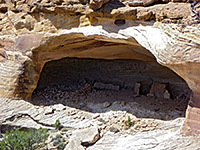 Many Navajo tribespeople had taken shelter in the cave, whilst under attack from Spanish soldiers, the location being difficult to enter from below but within view of the canyon rim, and as a result, after a day of fighting, over 110 were killed. The other overlook is of a small ruin (Yucca Cave) tucked into a side canyon alcove, reached after descending a short set of steps.